Please contact us for pricing and booking information. Here at Twisted Fish Austin Boat Rentals, we make it easy to plan your day on the lake. We have Pontoon Party Boats and Luxury Cruiser Yachts for you to choose from. Online reservations make it easy to book your outing. Below is a listing of the starting hourly rates for all of our boats. Choose which package you’re interested in and on the next page, you can choose your boat and touring options. Weekday rental prices discounts apply! Online reservations in maintenance. Please call for pricing information. 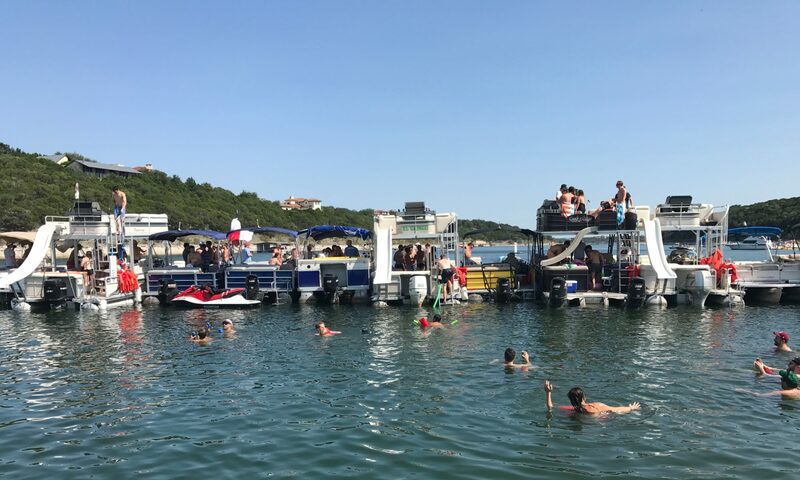 Check below on our Austin Boat Rentals on Lake Travis boat listings fleet information so you can get to know each of our boats and choose the one for you! Currently, we provide Pontoon Party boats, and Luxury Yacht Cruisers. Just Click on the boat you’re interested in to see more information and to check out available booking dates! Lake Travis is the second lake in the famous Highland Lakes, which is a chain of 7 lakes that stair-step up the Colorado River from Austin. The other Lakes are Lady Bird Lake, Lake Austin, Lake Marble Falls, Lake LBJ, Inks Lake, and Lake Buchanan. Lake Travis is the largest of the Highland Lakes. There’s no other lake like it. Revered by many, scenic Lake Travis is 63.75 miles long and 4.5 miles across at its widest point. The lake with its blue water and bluffs covers 18,929 acres and has a capacity of 1,953,936 acre-feet. Lake Travis is considered full pool at an elevation of 681.1 msl. At this elevation, the lake contains 382,092,882,600 gallons of water. There are 270 miles of scenic shoreline around the lake, a lot of it is rocky, bluffy limestone with coves and dripping springs that are breathtaking. The maximum depth is 210 ft. with an average depth of 62 feet. The lakes historic high level is 710.4 feet msl on Christmas Day, on December 25, 1991. Its historic low-level is 614.2 feet msl on August 14, 1951. Lake Travis was created by the impounding of the Colorado River by the construction of Mansfield Dam in 1937- 41. The dam is 266.41 feet high, 7,089.39 feet long and 213 feet thick at its base. Mansfield Dam has twenty-four, 8.5 feet in diameter floodgates each with a 4,770 cfs capacity.